This one is for the cat lovers. I painted this in my watercolor class Tuesday – I got inspired by a picture I saw in an instruction art book. However, I have to admit, I’m not a big fan of cats – probably because I’m so allergic to them. I have a feeling my step-mom is going to love this painting – she is a big cat lover. I love your cat painting . 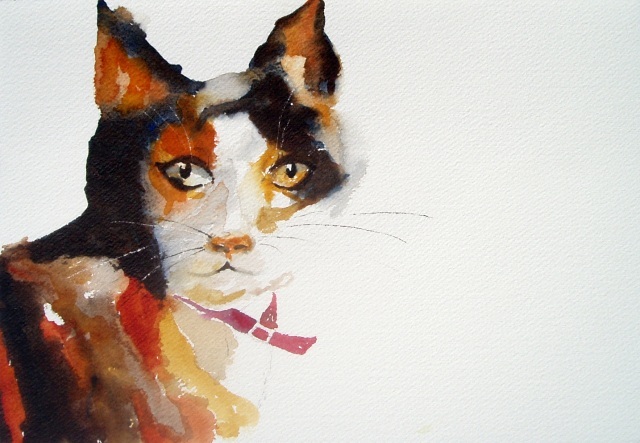 I had a cat just like your painting and her name was “Callie”….short for “Calico”. She lived nearly 18 years. Thanks for sharing your blog. I love watercolor paintings because my Mom is also a watercolor artist and I have many of her paintings in my house.